Want to look and feel your best naturally? 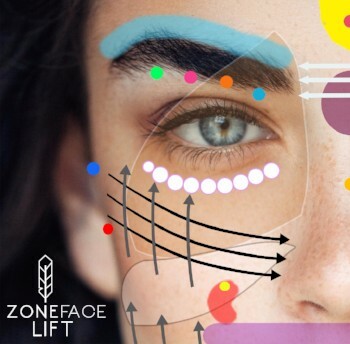 Zone Face Lift therapy is a unique method that was developed by Ziggie Bergman, after many years’ practising Reflexology and studying with Native American shamans and healers in New Mexico. This calming and uplifting treatment has been developed to work deeply on facial tissue, to increase the blood flow, oxygenating the tissues and stimulating the production of collagen and elastin. Skin looks more contoured, fresher and, over a series of treatments, tighter. Regular facial massage such as this technique helps to reform facial tissue and re-programme habitual repetitive actions such as frown lines. This deeply relaxing treatment combines facial reflexology with effective ancient and modern face lifting massage techniques as well as specialist tools including Gua sha and quartz crystals. It promotes a kinder holistic approach to helping you to naturally look your best. This is a great treatment to have before an important event, when you want to look your best, but for optimal results a course of 12 weekly treatments is recommended. Many client’s report noticing a big difference after 4 or 5 treatments, although everyone can feel and see the benefit after the first treatment. After attending training with Ziggie Bergman in London, we are very pleased to be able to offer this unique and wonderful treatment at Dancing in the Rain. 6 treatments - £330. This can be payable in two instalments, £200 at the first appointment and £130 the following month. 12 treatments - £600 - this includes a free facial oil and gua sha tool. This can be paid in three instalments, £250 at the first appointment, £250 the following month and £100 the third month. Please note, these special offers are for people who would like regular weekly treatments. The course of 6 treatments should be used within 12 weeks and the course of 12 treatments should be used within 24 weeks.